I am nearly out of laundry soap so I am going to have to mix up another batch. It is super easy to do and economical too! Place on medium heat and stir occasionally. The soap will melt and just bring it to a boil. 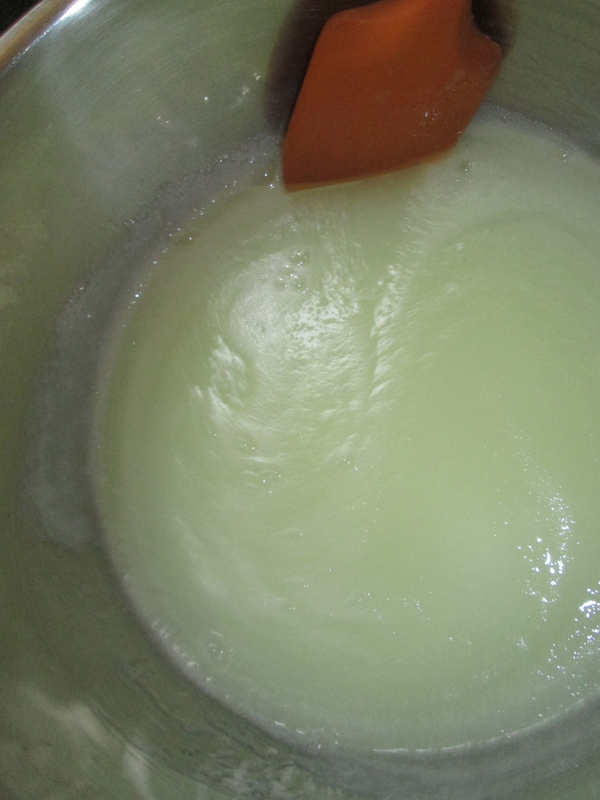 Here, I am heating to melt in the shaved soap and merge the ingredients. Remove from heat and let it cool for a while. When no longer hot, warm or cold are fine but the soap will be very gelatinous. Now I set this in the sink to cool. Wait about a half hour and it will be sort of a semi solid gel. Stir with a blender stick. If you don’t have a blender stick but have a blender it is slower work. You have to take a couple of cups at a time and add equal amounts of water, blending until it is well mixed. The last bit of blending and the soap is ready to use! If you are mixing it in a blender, pour each mixed batch into your jugs. If you are mixing it in a pot, you can either leave it in there covered and use it as you need it, or pour it into jugs. I prefer the later because while it is a big messy getting it into the jugs there is no mess using it. From a dripping cup. In either case, pour the mixture into laundry soap jugs. I got four of these from a local laundromat and have been using the same jugs for 3 years or so. As you see I blended it nice and smooth; however after it is in the containers for a bit, what it looks like is sort of translucent, and lumpy liquid soap. Cost is less than $2 for 2 gallons of soap. PS: I use lemon scented soap and add lemon essential oil to mine because this is my favourite soap scent. I forgot to mention that this is a low suds soap which makes it ideal for HE or regular use. 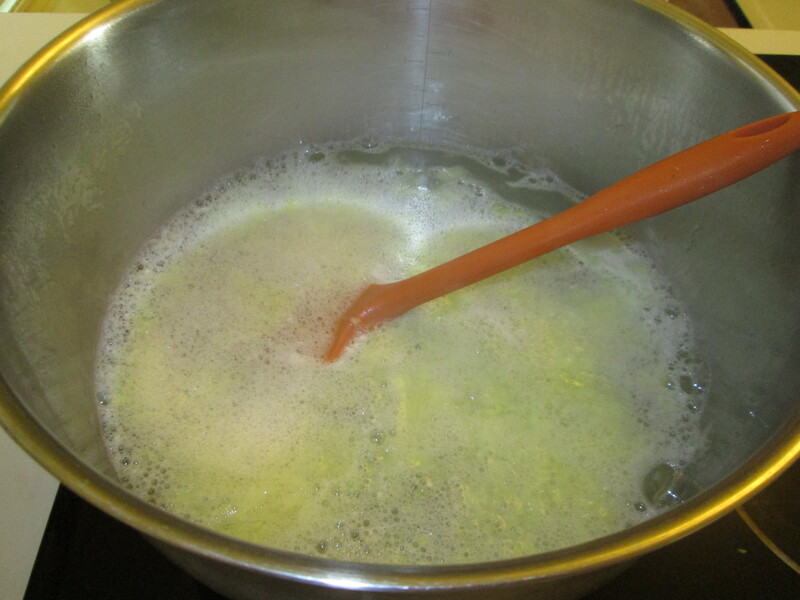 I use about a third of a cup of the finished laundry soap per load of wash.
One of my readers said this is the best cleaner for a ceramic cook top that she has ever used. I tried this and I agree it really does work wonders! I will be posting this recipe on the http://www.meetup.com/communikindred-in-ontario/ intentional community group forum, in the “Methods, Ideas, Plans and Products” section that is available to the public. Whether or not people choose to join, we are trying to educate about Green Living practices, and while I was researching doing laundry 0ff-Grid, this came up. Your blog is awesome, thanks so much for the recipe! 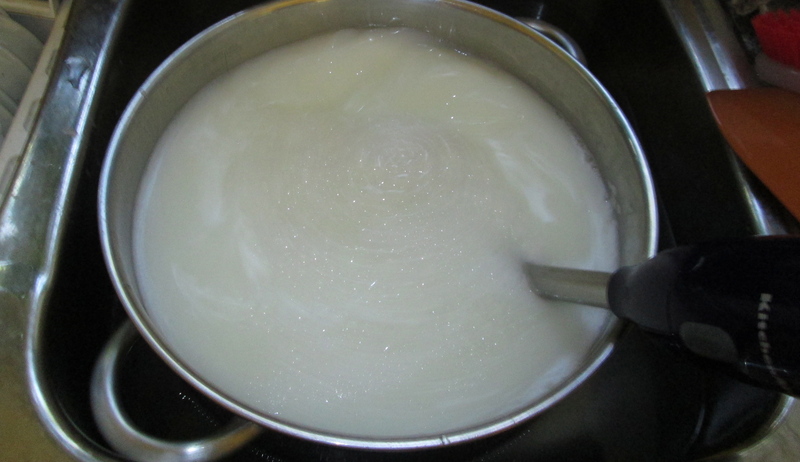 I made laundry soap for the first time…about six weeks ago, following your recipe. It turned out great. I Love it…no more buying soap for me… Thank you for sharing. My husband and I are beginning the tiny life with our own build and I’m looking into biodegradable soaps/cleaners that will be safe for our grey water drainage. Don’t know much about this all yet, so maybe this is a silly question. But is this laundry soap safe for draining on the lawn/garden after it’s been used? Awesome! Congratulations on your decision to go tiny! In the location where I am, which is forest on a four feet deep layer of mixed soil and rock, covering an 85 feet deep layer of limestone bedrock, water filtration for grey water is not a problem. Most of my needs are met with rain water and I carry in the clean water I need for ingesting and rinsing dishes. I use environmentally safe dish soap and shampoos as well as the laundry soap above (though I don’t do laundry at THO) so that I won’t damage the environment. This said, my property is essentially a perfect filtration system. Plants, dirt and all that limestone make water use simple. Even if I were to use a thousand gallons of water a day, the property I live on would drain with no trouble at all. My water use is about a gallon a day though. to answer your question, yes as long as you use environmentally friendly bar soap then this will be good do dump but you might want to use a pot system to filter it a little bit too. Laura LaVoie over at Life in 120 ( http://www.120squarefeet.com ) has one, but her search button appears to be a bust, so I can’t find the article for you. I bet if you ask her to share her grey water filtration solution again, she will be happy to do so. I share the bit about my land to caution you that not all land is like mine. You may not be located on a property that has great drainage as I have, so please be aware that laundry takes quite some water and you will want to be aware so that you don’t flood yourself out. Thanks for the recipe. We will be running out of store bought (all natural) washing soap, and want to replace it with home brew. Toothpaste, shampoo, conditioner, dish washer soap already converted. Let me know if you are happy with it. Many of my friends are making it and they are very happy with it. I am sure you will be as well.